China has contributed a lot to the world's achievement of the Millennium Development Goals (MDGs) by significantly reducing poverty and hunger in the country, a senior official of the United Nations Food and Agriculture Organization (FAO) said on Oct. 14. The year 2015 marks the end of the monitoring period for the MDGs. During the MDGs monitoring period, the world's population living in extreme poverty was reduced from 43 percent in 1990 to 17 percent this year, while 72 of 129 countries, China included, achieved the target of halving the number of undernourished people amongst their nations by 2015. "This is a remarkable achievement, and China contributed a lot," said Percy Misika, FAO Representative in China, DPRK and Mongolia, during an interview with China.org.cn to mark the 35th World Food Day on Oct. 16, and China's second Poverty Alleviation Day on Oct. 17. 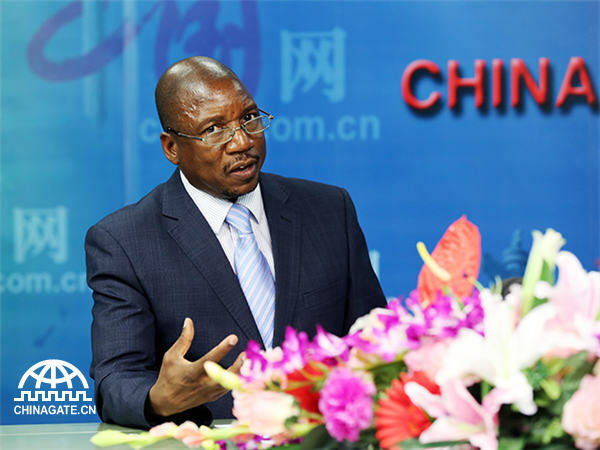 Misika applauded the Government of the People's Republic of China for convening the 2015 Global Poverty Reduction and Development Forum on 16th October in observance of China's second Poverty Day, a day which coincides with the World Food Day. China feeds almost a quarter of the world's total population with only nine percent of the world's total arable land and six percent of global fresh water resources. According to official statistics, from 1978 to 2010, China lifted more than 600 million people out of poverty. This meant that about 75 percent of the reduction in the poor population occurred in this country. According to FAO estimates, China reduced the prevalence of undernourishment from 23.9 percent in 1990-1992 to 10.6 percent by 2012-2014. However, according to Misika, China is still confronted with many challenges amid the successes. China still has about 70 million people who are living below the poverty line. Moving these people out of poverty remains an arduous task. While this is doable considering China’s track record in this regard, it will be a challenge because this has to be done while also ensuring that the millions who currently live just above the poverty threshold do not slip back below the poverty line. China is still at the stage of fast industrialization and urbanization with both phenomena resulting in increased competition for land and water resources. In addition, China still has to take decisive measures to tackle imbalanced or inequitable development between rural and urban areas, among different regions and among different social groups, an aging population, declining and degrading natural resources and climate change effects, and food safety issues. China and FAO has maintained a close and mutually fruitful cooperation since the establishment of the Organization and establishment of the FAO Representation in the country in 1982. Over the past 35 years, FAO has supported over 400 projects amounting to more than US$200 million in China, covering diverse fields such as agriculture, fisheries, forestry, sustainable natural resources management, animal and plant diseases and pest control and prevention, food and nutrition security and food safety, and south-south cooperation. In the future, the FAO will intensify cooperation with China, Misika said. Moving ahead, Misika hoped to see China work closer with the FAO and using its experiences, technological innovation, expertise and financial resources to help other countries. FAO's work in the country will be guided by the FAO-China Country Programming Framework (CPF) 2016-2020 which is currently under formulation. The CPF will be aligned to and draw linkages to the national agriculture development priorities that will be encapsulated in the 13th Five Year Development Plan, the United Nations Development Assistance Framework (UNDAF) and FAO’s own global Strategic Framework, taking into account FAO’s comparative advantages. At the UN summit held in New York last month, Chinese president Xi Jinping announced establishment of a US$2-billion SSC fund to facilitate developing countries' implementation of the Post-2015 development agenda as part of China's efforts to play a greater role in fighting global poverty. He also pledged to invest at least US$12 billion in the least-developed countries by 2030, relieve the debts of the outstanding intergovernmental interest-free loans due by the end of 2015 owed by least developed countries, landlocked developing countries and small island developing countries, set up an international development knowledge center to facilitate studies and exchanges of theories and practices of development, and a global energy network to facilitate efforts to meet the global power demand with clean and green alternatives. FAO applauds these measures and commends China for taking decisive measures towards the implementation on SDGs. While in the past, the cooperation between China and FAO was based on a "one way" mode with FAO providing technical assistance for policy advice and advocacy, norms and standards setting, information collection and dissemination and knowledge, skills and technological transfer, the 21st Century has witnessed a change from this mode of collaboration to a two way collaboration with FAO still doing what it did in the past on the one hand and with China increasing becoming an indispensable development partner of FAO in promoting South-south cooperation to help improve the capacities for sustainable agriculture development in other developing countries. As we embark on the implementation of the Post 2015-SDG Agenda, FAO stands ready to work with China in its noble efforts aimed at achieving the SDGs at home and in helping other developing countries achieve the same so as to ensure that no one is left behind.